This is the first Times of Malaya building, which was along Post Office Road. 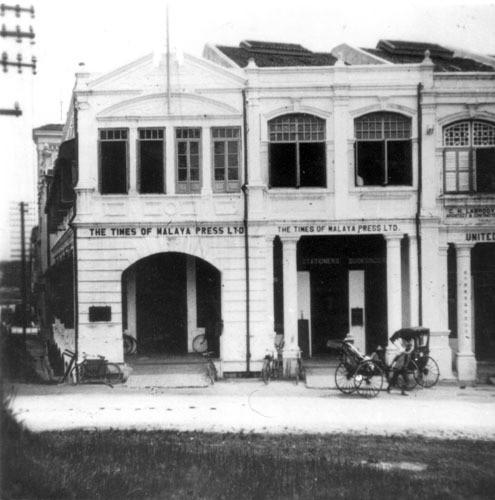 The first issue of Ipoh’s first newspaper was published on 9th March 1904. 2 years later, the newspaper was taken over by J A S Jennings – who remained the paper’s most influential editor for a good 30 years! In the early 1930s, the Times of Malaya moved to a new building, along Brewster Road (see picture below). After the war (after 1945), this building was used by the Public Works and the Department of Drainage and Irrigation. What’s become of it now? Can anyone fill us in on the latest? We thank Nicholas Jennings – the grandson of J A S Jennings – who sent us a copy of these rare pictures. if I am not mistaken…Maju Perak is the present tenant now. Where is Post Ofice Road today, and are these buildings still standing today? Thank you. Post Office Road is where it always has been (HaHaHa) but they have renamed it twice, first Jalan Dewan and then Jalan Dato’ Sagor to commemorate one of the murderers of J W W Birch on which Road his memorial clock tower stands. The road on the other side of the tower is also named after one of the same assassination team, Jalan Dato Maharaja Lela. This was once called Station Road. Sorry – to add to the above, the first TOM building was taken over by the Chamber of Mines and then demolished to be replaced by the LaBrooy building. 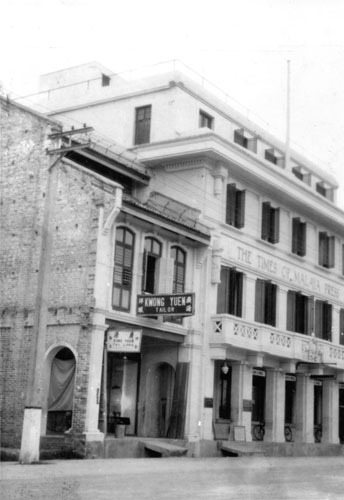 The second building still stands and can be recognised by the crest at the top of the facia which reads T O M.
This building now is occupied by Yayasan Perak at Jalan Sultan Idris Shah. The emblem of The Straits Times Malaya remain. It’s unthinkable that they should name a road after a murderer and disheartening that all the roads named after our original founders who have contributed so much to the development of modern Ipoh has been omitted or systematically erased. I do hope that all the original colonial names to be reinstated and not only that, a small plaque commemorating their contributions to be erected beside the road sign. That way we will know more about the history of modern Ipoh. At times they have taken nationalism too far to the extent of disregarding history. There is always the opportunity to remember local personalities. For instance, new roads, new buildings, new schools can be named after them.